You're going to fall hard for this spicy and hearty homemade beef chili. 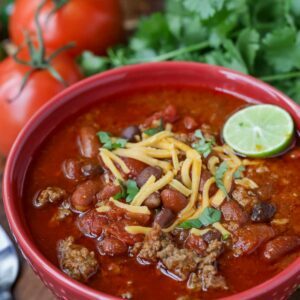 This chili recipe is not only simple, but is flavorful and filled with ground beef, tomatoes, beans, spices and all the toppings making it an award winning chili recipe. In a large pot, cook ground meat. Drain excess grease and add tomatoes, seasonings, and water, bring to a boil.